In this week's new Kitchissippi Times: Part 2 of my three-parter on the story of the Hinton family. Digging deep in the archives to piece together their story, including rare photos that finally put a face to the name "Hintonburg". This part focuses on the years when the Hintons came to Richmond Road, built the amazing house you see in the photo below, and took the original steps to create the community. 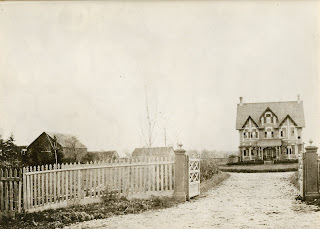 of Holland Avenue, circa 1875. This is a story from nearly 50 years ago that only older long-time Hintonburg residents might remember. But it is such an important story in how the neighbourhood would develop, and specifically how many of Hintonburg's most important locations came to be. It's actually a pretty crazy story, and I am happy to share it now, here in the Kitchissppi Museum. Enjoy! In the late 1960s, recreation for both youths and adults was an issue in Hintonburg. Residents complained about the lack of options in the neighbourhood to keep kids busy, and to keep active. The area lagged behind most other communities in services, and was largely ignored in 1967, the year of Centennial capital building projects. Hintonburg, and even the surrounding neighbourhoods had very little recreation space at the time. The St. Francis Hall/Rec Centre (where Hintonburg CC now stands) was located in the chapel of the original St. Francois D'Assise Church and featured most notably a bowling alley, but the building was small and outdated (the City leased the hall several nights a week for recreation programs). There were outdoor rinks in the winter, and a few pool halls, bowling alleys and movie theaters in the area, but it was thin beyond that. Residents began to push the city for more facilities, and Hintonburg was promised they would get their due attention soon, and that opportunity came in 1971. In that February's budget, the Recreation and Parks department received a significant allocation, a total of over $1.5M in funding (well up from the $300k received the year previous). The biggest commitment made at the time was $300,000 marked for the purchase of land in Hintonburg, for the erection of an indoor pool complex as soon as 1972. The top site being considered for this purchase was the former CPR roundhouse site on the east side of Bayview (which of course is now the site of Tom Brown Arena). 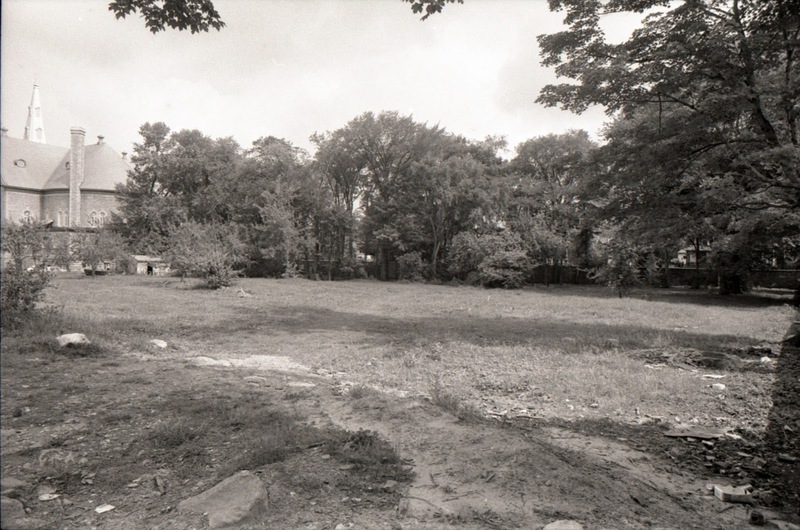 However, at Council meeting on Monday October 18th, 1971, approval was given to spend $400,000 to acquire two acres of land from the Capuchin Fathers (St. Francois D'Assise Church) plus three private properties along Duhamel Street, to construct "an indoor arena, playground, community centre and parking lot". The five-year proposed budget did not earmark funds for the construction of the arena itself, but it was felt that funding for that project could be re-prioritized and budgeted for in a future year. Alderman Rolly Wall estimated the full project would cost $1M including the land acquisition. In order to acquire this land, the City expropriated 1.3 acres from St. Francois Church, and were in the midst of negotiating the purchase of three privately-owned properties (which later turned into a as many as 25 housing units that the City was attempting to acquire, comprising most of Duhamel and the north end of St. Francis Street). These additional properties were to be razed in order to make room for the arena's parking lot. The plan also called for Duhamel and St. Francis Streets to become dead ends. One potential flaw in the arena plan was that the design called for the construction of 1,500 seats in the rink but only included parking for 90 cars on site. A few weeks later, some residents in the area opened their mailboxes one morning to find letters from the City of Ottawa indicating that property was to be acquired by the City. 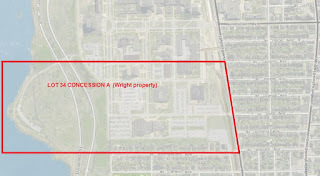 "This is to advise you that city council at its meeting of Oct. 18, 1971 approved the acquisition of your property known as 13 St. Francis St. in connection with the recreation and parks sports complex. ", stated one letter. Residents were fearful of losing their property which, in some cases had been in their family for multiple generations. Whatever little support the City may have had with the proposed project was quickly slipping with the way they were managing it with the local residents most affected. 1972 began with Ottawa Mayor Fogarty announcing that the city's top priorities for the year were to begin building a "major sports complex" at St. Luke's Park off Elgin Street, lease land from the NCC for a golf course, establish more day camp programs for the summer, construct at least 10 centrally located tennis courts, and to acquire the land for Hintonburg's Fairmont Avenue Arena. News on the arena development was slow in 1972. 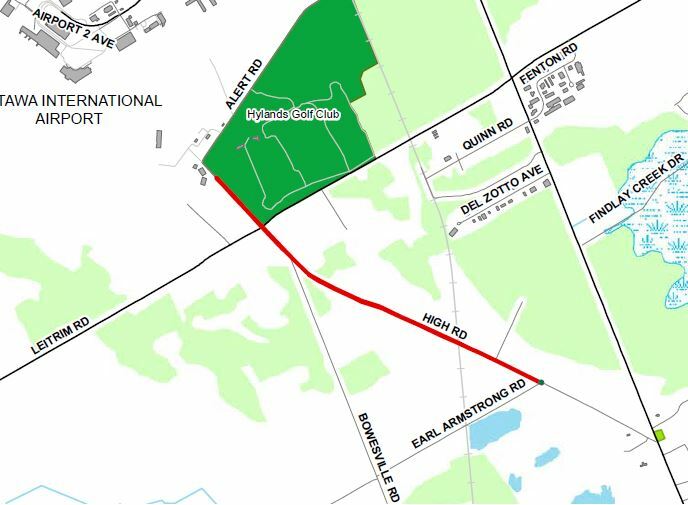 In May, the Ottawa separate school board came out in opposition to the arena, citing that there was not enough space in the area, which was directly behind what was then Sacred Heart School. In fact, the earliest land acquisition talks the City had were with the Separate board in acquiring the Church land for a joint school-city playground area. By August it was reported that the City had purchased three of the six properties they required specifically for the arena's parking lot. The Journal reported that the other three homeowners did not want to sell. A fourth was acquired by October. 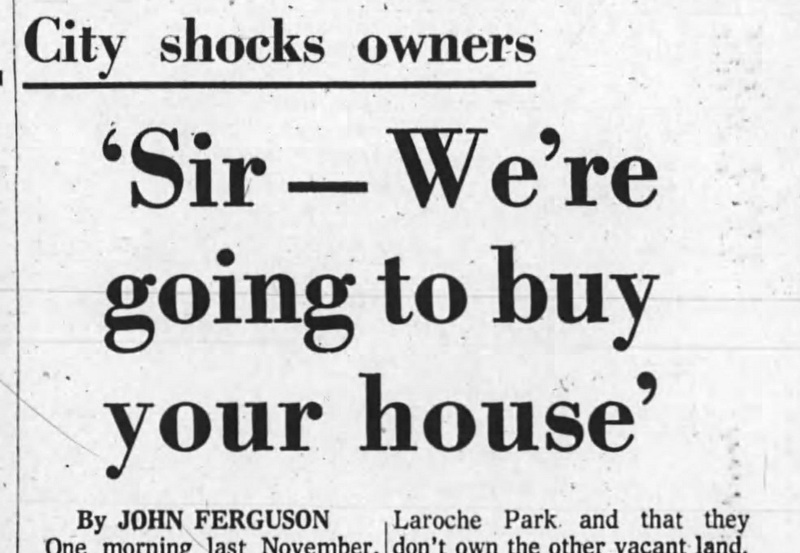 Homeowners were told they would have to vacate their properties by January 1973. The remaining were expected to be expropriated (their homes sold to the city without their approval required) soon after, if negotiations were unsuccessful. But as the proposal began to become more real, local residents started to fight it. A petition was circulated in the neighbourhood that summer citing the problems the arena would cause, chiefly that the quiet neighbourhood would be significantly changed, that many more cars would be parking throughout the neighbourhood, fire protection and snow removal would be compromised, and much needed housing units lost. Residents pushed for the arena to be built in an area where expropriation wouldn't be required, such as Laroche Park or the former roundhouse site at Bayview. Officials countered back that they did not want to build on Laroche Park, and that the Bayview site was not even owned by the City. Morris Nolan of 26 St. Francis Street pointed out that generally an arena does not serve the area in which it is constructed, or at least in significant part; that teams from all over the city and suburbs would use it from early morning until late at night, and that if the City was focused on providing recreation for the majority of the people in the area, that a park would make the most sense for the space. Mrs. Battool Escander, a 26-year resident of St. Francis Street was upset. "This is my home. I like it. Now they want to tear it down and move me somewhere else" she told the newspaper. Mrs. Margaret Hart, a resident of the area for 25 years, felt she would have trouble buying another home with the money the city offered her. The battle became not just a fight against an arena, which almost all local residents were opposed to, but also a stand on the principle that residents should be involved in planning projects, which they felt they had not been. "They'll call us in after the plans are drawn up and ask us what color scheme we want and where we want the doorknobs" said one resident, "And they call that participation in planning." That summer, a youth group called 'Catalyst' conducted a survey in the area, sponsored by a grant from Opportunities for Youth, to measure attitudes on a variety of topics. One of the questions found that 68 per cent of the 180 families surveyed wanted to see the vacant church land used as a "passive park" (a park with only minor features, such as benches and picnic tables) or a children's playground, while 20% favoured a community centre ,and just 7% wanted the arena. Certainly the consensus was that residents felt that the park should remain a park for children, and that money should be put into adding a playground to the space. The large apartment building across the street on Wellington was also in the midst of construction, and it was felt that the seniors in that building would benefit from the parkland. The Journal further noted that Statistics Canada figures showed that the ratio of persons over 65 in the area was about 50 per cent higher than the average for the city. However the local Alderman Walter Ryan argued that the $400,000 price tag paid for the Hintonburg Park property was too expensive to use for just a park, and it was also noted that there was little flexibility in the city budget, and that $1M allocated for a rink could not be simply transferred to a park. 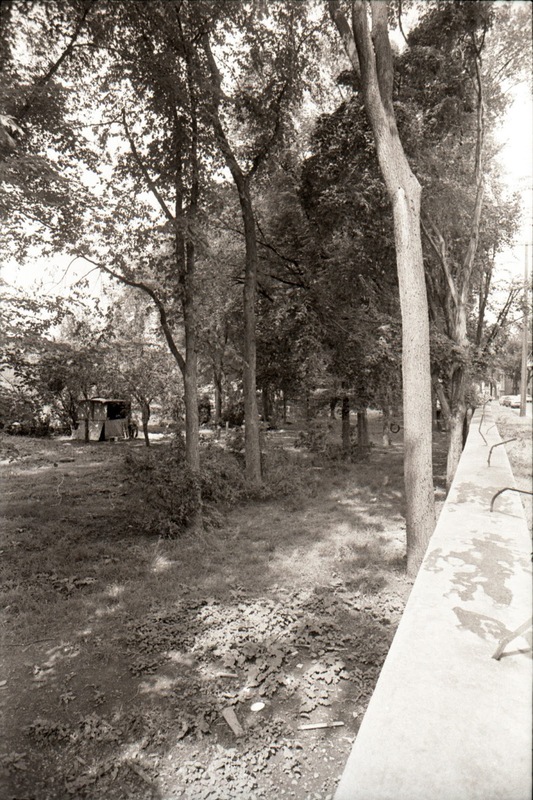 Hintonburg Park had a long history as the gardens for the Capuchin Fathers, and by 1972 still had a large number of trees on it (certainly many more than it does today), including significant numbers of plum and apple trees, and "about 30 other large, mature trees". It was still a popular spot for children to play, and for many years was home to outdoor ice rinks in the winter for local kids to play on. old storage shed can be seen at left. The Journal editorial in August 1972 agreed with local residents, and argued that city official reconsider the plan, and that "a new effort should be made to find out what the residents of the area really want today, not what they might have thought they wanted five or more years ago." A month later they were steadfast in their opposition, editorializing "Who wants this rink?" 200 residents came out to a meeting in mid-September to confirm their opposition to the arena plan. Alderman Water Ryan admitted he had changed his mind on the arena as well "I was party to recreation and parks' decision over a year ago to build the arena. But in the past six months, I've realized it was the wrong decision. It would mean tearing down perfectly good houses. The arena would also be a city facility rather than a community one". He said he favoured construction of a community centre similar to the planned St. Luke's centre off Elgin, which would cost considerably less than an arena. Yet, west-enders did still want an arena, and wondered why Laroche Park could not be used. Walter Ryan noted that "we looked at four other sites and this was the largest lot of open space requiring the least amount of demolition", though he would not name the other sites considered. Alderman Wall stuck to the Fairmont Avenue location, stating "if you want an arena, it has to be there." The political wheels began to be set in motion that fall, while many passionate residents began to rise up against the proposed arena. Based on overwhelming public pressure, Alderman Ryan went to Council and advised them to halt the land acquisition for the arena, and to sell any land already acquired on Duhamel and St. Francis, of course first offering them back to their former owners at the same price, less any additional costs the former owners had incurred. The Parks department was also asked to look at alternative uses for the church property acquired from the Church. Ryan felt a community centre and small pool could be built instead. Meanwhile the Laroche Park Community Association circulated a petition demanding the arena be built instead in Laroche Park. Concurrently, with no official decision yet made by City Council, on October 13th, a group of 22 Hintonburg homeowners applied for a Supreme Court injunction to stop construction of an arena. Their application was based on the case that the proposed 90 parking spaces was far below the minimum requirements set out in the city's zoning bylaw. They stated that the bylaw stipulated one parking space for every 100-square feet of enclosed area, or one for every four permanent seats, whichever requires most, thus a need for as many as 375 parking spaces. On October 17th, it was announced that the Board of Control would continue to proceed with their expropriation of the land behind the Church, though they cautioned "no definite decision has been reached on building an arena on the site". The Ottawa Journal reported that an "incensed" Controller Garry Guzzo stated "Let's get on with the project. Let's give the arena to somebody that wants it. ", while Controller Tom McDougall added "I'm sure the Canterbury district would be pleased to have it." The Board put the decision in the hands of the recreation committee for a final decision. John Tucker, acting commissioner of the committee, had already looked at Laroche Park and stated it was too small and should not be considered. The Board however was looking at other land on Bayview adjoining Laroche Park on the north side of Scott. On Halloween 1972, a heated two hour debate resulted in the the Recreation and Parks Committee officially cancelling the Hintonburg arena plan, and instead approving an arena for Canterbury. As an alternative, Hintonburg was approved for capital funding for construction of a community centre in 1974, in the park space behind the Church. The plan would indeed be modelled after St. Luke's in Centretown. It was also noted though, that the old recreation hall (next to the Church on Wellington, to the west) was to be sold within the next year, and that this could be another possible location for the new community centre. Ryan stated a community centre in Hintonburg "is now guaranteed for 1974". Oddly a week later city council left the recreation committee's recommendation off their council agenda, spurring the Hintonburg residents to restart their legal action against the City. But at their next meeting on November 20th, council accepted the unanimous recommendation of the Board of Control to have the Hintonburg arena plan officially cancelled. 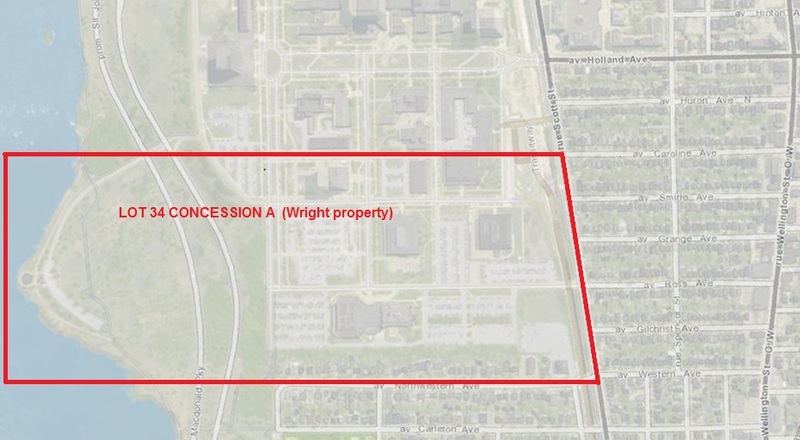 The Fairmont Avenue Arena plan was officially dead. In early 1973, the former St. Francis Parish Hall/recreation centre/bowling alley was indeed put up for sale by the Capuchin Fathers, due to high overhead. An agreement for sale was made with a developer (Marvo Construction Co. Ltd.) who wanted to build a high-rise apartment building for seniors. However, Planning Board rejected the application. In March of 1973, Planning Board instead passed a motion "strongly" recommending the City to acquire the St. Francis Hall, renovate it, and use it a community centre. This would thus allow the park behind the Church to be left intact in its natural state. Planner Arnold Faintuck and his staff found it was possible to renovate the old centre (at a cost of $100,000), rather than demolish it, which was planned. The city agreed and entered negotiations, which was rumoured to run as high as $250k (the final price was $235k). 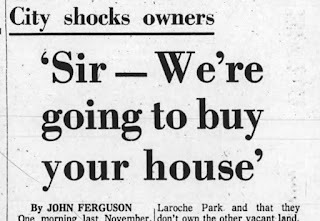 The sale was official in September of 1973, and immediately, residents of Mechanicsville and Hintonburg met with Community development commissioner Douglas Wurtele. They proposed pooling the talents of the local residents to do the renovations to the centre, reducing the $100k renovation price tag, and "bring residents closer together in a common project". The commissioner endorsed the "novel approach", and added that any money saved through volunteer labour should be spent on other projects in the community, though noted that ultimately city council would make that final decision. The new "West Ottawa Community Centre" opened in November of 1974 in the renovated old Parish Hall, and operated until it was demolished in the spring of 1988. The new Hintonburg Community Centre was built in its place, and opened on May 1st, 1989 at a cost of $3.8M. Meanwhile, going back to 1975, the original city budgets for that year once again included $1M for an arena in Hintonburg. However over the following week, it was discovered that the city's community development committee had mistakenly projected expenditures 30% above 1974, yet were capped at the previous years level. Therefore the Hintonburg arena was the first to go. However, it was placed in a long-range budget for 1979, for an "unspecified location". It was in January of 1979 that the Tom Brown Arena would open, giving Hintonburg it's long-awaited arena, on the site of the former CPR roundhouse. While each of these important public facilities in Kitchissippi - the Hintonburg Community Centre and Tom Brown Arena - deserve (and will someday get) their own detailed "history of" article here in the Museum, their existence, or at least the fact that they exist where they do today is so significantly tied to the almost-Fairmont Avenue Arena in 1972! So too is the reality that we still can enjoy Hintonburg Park in basically its original natural and undisturbed state today. Most importantly, all of this is really thanks to the impressive efforts of some passionate, caring Hintonburg residents back in 1972 who gradually won over their councillor, the parks committee, Board of Control and eventually City Council, to fight what would have been a big change in Hintonburg's development going forward, and certainly would have changed the character of the neighbourhood around Fairmont-Duhamel and the St. Francis D'Assise Church... arguably the heart of Hintonburg. I'd venture to say that we are a lot better of with how things turned out! While researching one topic or another, I often find myself deep in to very old records, trying to piece together a story through whatever bits of information I can find. Every once in awhile, I'll come across the names of the Britt family, who lived in the area when very few did. In fact, this family may well have been one of the first five to reside in Kitchissippi. However their story is not easily told... their presence in Kitchissippi dated from as early as 1840 until 1867. A lot of years, but a period of time where records are extremely scarce. Making things trickier is the fact that the Britts never owned the land they lived on; they rented from a well-known and wealthy land-owner. So here is their story, as best as I can tell it. 29-year old Patrick Britt and his wife Johanna Brennan, along with their infant daughter Ellen, escaped to Canada from Ireland in 1840. While the worst of the potato famine was still a few years away, widespread crop failures were hitting farmers all over Ireland. Farming was extremely volatile, and many citizens were ill and starving. Immigration to Canada was a desperate solution, but the promise of a new life with boundless potential in a new country appealing to even the most loyal Irish. Canada meanwhile was very interested in increasing their population for a number of reasons, and even provided incentives to new citizens to entice them to come (some Irish settlers were offered a cow, basic implements and three bushels of seed potato to get them started on a new life). While the challenges that these immigrants faced in Ireland were severe, what they escaped to in Canada was perhaps equally as challenging, but in a different way. The immigrants were given land in rural, often remote areas, on land not necessarily fertile for farming. And they certainly were ill-prepared for the harsh winter weather. Whatever primitive lodging they were able to construct for themselves was often barely sufficient to allow them to survive through the long, cold winter months. "After the Napoleonic Wars ended in 1815, a growing number of people left the British Isles, particularly Ireland and Scotland, to make new lives for themselves in North America. Around 1830, an average of 30 000 immigrants arrived annually in Québec, the main port of entry to Canada. Approximately two-thirds of these newcomers were from Ireland. This unprecedented immigration to the St. Lawrence Valley took place at a time when major epidemics were raging on the European continent as well as in Great Britain; the second cholera pandemic (1829-1837) hit England in 1831-1832. The disease was carried to America and Canada by migrants, many of whom were Irish. People from Ireland often embarked for the New World from English ports. 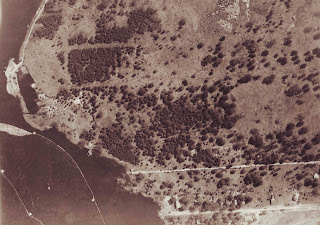 Reports that people with the dreaded disease were about to arrive via the St. Lawrence River immediately prompted the colonial authorities to set up a veritable quarantine station on Grosse Île, an island located in the middle of the river, 48 km downstream from Québec. The station had to deal with another cholera outbreak in 1834, before battling an even more deadly typhus epidemic in 1847-1848. Once again, the victims of the latter epidemic were mainly Irish immigrants. At the time, an unprecedented number of people were fleeing the terrible potato famine in Ireland: some 100 000 sailed for Québec in 1847. This period of virulent epidemics came to an end only after another outbreak of cholera in 1854." 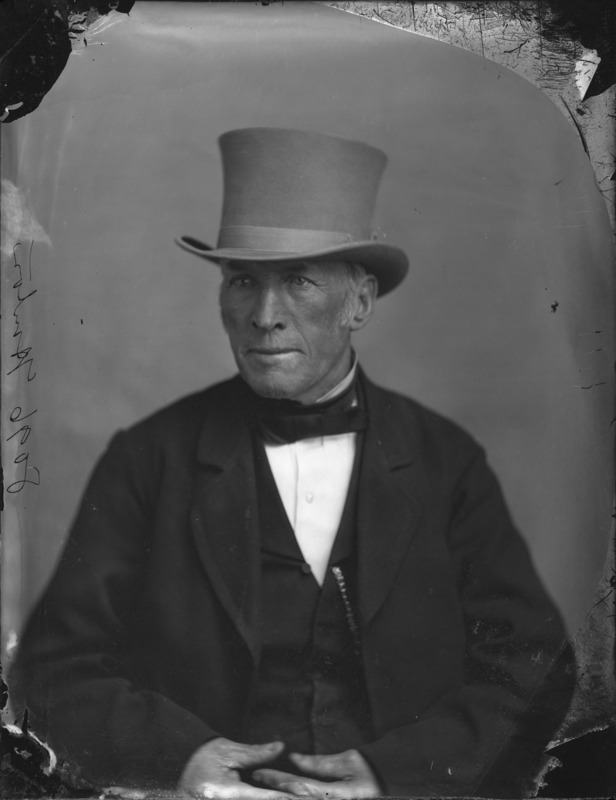 Records indicate that Patrick Britt's young wife Johanna passed away in 1840, though it is unclear whether her death was at sea, at Gross Île, or perhaps most likely, it was during the family's first winter in Canada. Regardless, in June of 1841, Patrick Britt appears in the register of Notre Dame Basilica in Bytown, marrying Anastasia Brian (a.ka. O'Brian), who was "lately from Ireland". (Interestingly Patrick was already listed as "of this place" even though he had been in Canada only a year by that time). The couple would have their first child the following year, on May 17th, 1842 when Anastasia gave birth to their son Thomas. They would continue to have nine more children over the next 21 years: Johanna/Julia (April 1844), John Patrick (Dec 1845), Mary (July 1847), Catherine (Dec 1849), Anastasia (1851-52), James (April 1853), Patrick (1854-1855), Michael (1859-1860), and Edward (Oct 1863). (Boring footnote I should add, in case someone working on Britt family history comes across this page: All of my names/dates I've verified through official records, but there is conflicting information about John Patrick and Patrick's information from various sources on the internet; John Patrick could be the name of the 1854-1855 Patrick instead of the 1845 Patrick). 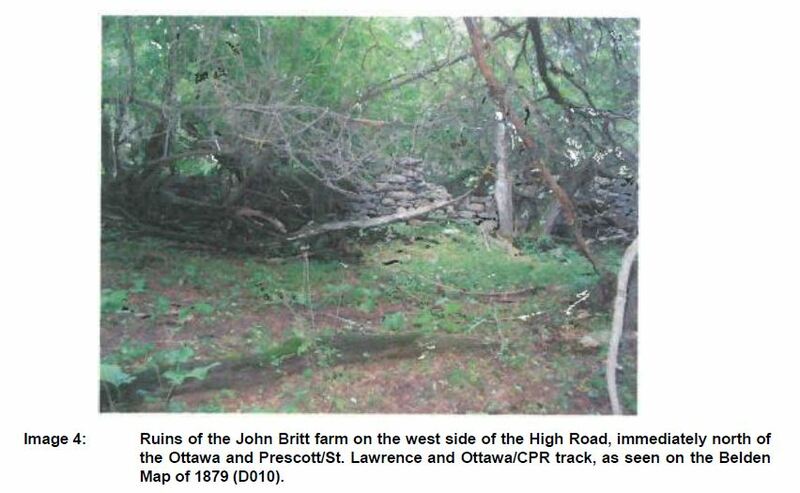 The Britt family would find themselves in Kitchissippi at some point in the 1840s or early 1850s, living on what was known as Lot 34 in Concession A of the "Broken Front" of Nepean Township. Concession A consisted of all the land north of what is today Scott Street, and it was called the "Broken Front" because the shoreline of the Ottawa River was not a straight line of course, and so all of the lots fronting the river had varying acreages. Ruggles died in 1863, and the land was transferred to his son Charles Brown Wright, who was a well-known businessman in Hull, one of the pioneers in cement production. Charles lived into his seventies, but his final few years were marked with sadness, as his business suffered during the economic depression of the 1890s, he lost his lot 34 property due to unpaid mortgage in 1895, and just a few months prior to his death in 1900, he lost his long-time home in Hull to the Great Hull-Ottawa fire. However, it was the Wrights who owned the parcel of land in lot 34, no doubt for investment purposes, for over sixty years. They never did anything with the property (as far as any records show), but they did kindly lease their land to the Britt family at some point in time, which could have been as early as 1840, when the Britts first arrived from Ireland. 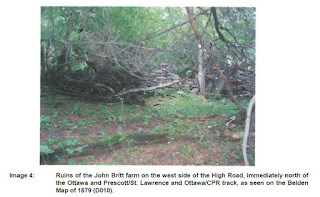 And it was on that land that Patrick Britt built what was described on the 1851 Canadian Census as a "log shanty", a small, basic home constructed using the trees and materials found in the vicinity, just a single storey high. had been gone for over 50 years by the time this photo was taken. Exact location aside, it was in this small rustic home that incredibly Patrick and Anastasia Britt raised their 11 children. The entire 100-acre parcel of land in lot 34 was valued at 85 British Pounds in 1860. That includes both the land, and the house! Patrick died sometime between 1865-1866, leaving behind his wife and their children, who ranged in ages from 2 to 26. Anastasia and the family continued to reside in the home, which even by the mid-1860s was still situated in the middle of isolation. For reasons that also can only be guessed at (perhaps it was the loneliness in the isolation, or the desire to move closer to other family, or just a wish to own their own land), in 1867 the widow Anastasia Britt purchased from Thomas Murray the north half of the south half of lot 19 in concession 3 of Gloucester Township. 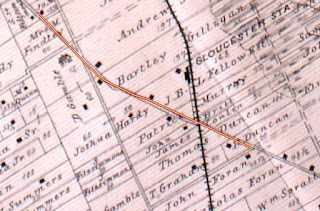 This was a long, thin piece of land at the intersection of a well travelled road (now known as High Road) and the Bytown and Prescott/St. Lawrence and Ottawa Railway line. This rural community was known as "South Gloucester". Other Britts were located in this area, I believe Patrick's brother and sister-in-law and their now large family. It was likely a deciding factor for why the family relocated here. The entire family move out here, and amazingly, even fourteen years later, on the 1881 census, Anastasia then at least 60 years old, was still listed as living with ALL eleven of her children still at home (ranging in ages from 18 to 42). The 1880s would see much change though, as several of the children married, at least two of them died, and Anastasia herself died in 1890. In fact the death register for the Church in South Gloucester had an entry for Anastasia who died May 21st, 1890, and the next entry was for daughter Mary, who died May 27th. of High Road, immediately north of the railway tracks. Certainly the Britt family has many, many descendants from Patrick and Anastasia Britt, as several of their children had many children as well (youngest son Edward, who I believe was the last of his siblings to pass away in 1933, had ten children of his own, according to a family tree on Ancestry). I'm not certain if any have returned to Kitchissippi, and if they have, I'd be surprised if they even know of the connection! Without spending hours more digging into the descendants of the Britts, I could not find any obvious notes of significance on the eleven children of the Britts. 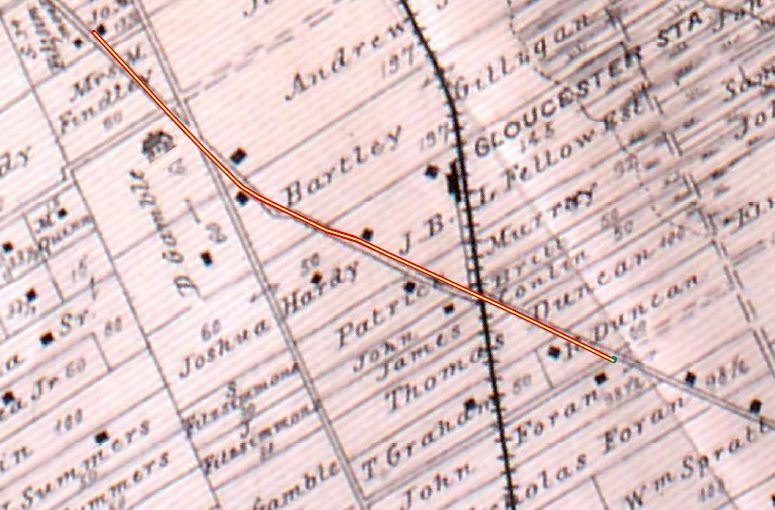 There is no trace left of the Britts in Kitchissippi, and really, if it wasn't for a handful of old civic documents, there likely would be no memory of them whatsoever. While the details are a bit hazy, and I've taken a bit of leeway in connecting a few dots in their lives, I think their story is at least representative of an incredible story of will, determination and survival, experienced right here in Kitchissippi during the earliest days of our neighbourhood, and well worth documenting, at least as much as I possibly could! (If any descendants of the Britts come across this article, I encourage you to post and share any stories or details of the family and/or their descendants. I also must thank "Taylor" who posted to bytown.net a few tidbits that helped open the story a little more, as well as two or three individuals who posted cited documents on Ancestry.com that helped as well). After years of on-and-off research, I finally pulled together all of my research, and have put together a profile of the Hinton family. This is perhaps the column I am most proud of, for the amount of digging invested, and the importance of the subject matter. Until now, very very little has been written on the Hinton family (namesakes of Hintonburg). So for the first time, the Hinton family are being brought to life! Bruce Elliott wrote a little about the Hintons in The City Beyond, and there are bits and pieces scattered around the internet on them, but largely their story has been largely hidden. And until recently, I had never even seen a photograph of them, nor had any of my historian contacts, some of whom had researched the Hintons themselves. It was through deep digging in the archives that I unearthed the first photo, which was mislabelled as "J. Hunton". I conferred with one of Ottawa's top historians Bryan Cook (who has published a book on William Pittman Lett, son-in-law of Joseph Hinton), and he shared with me a small, grainy old photo of what he believed was Joseph Hinton, though unconfirmed. We compared the two photos and agreed it was a close enough match. But I still was not 100% sure either or both photos were of Joseph. I then lucked out on finding a set of three photos donated to the Bytown Museum, which had photos of Joseph and Robert Hinton, as well as their famous Richmond Road farmhouse. The photo confirmed my original photo was Joseph as well! For good measure, some deep diving into the Lett family fonds at the city archives unearthed even one more photo of Joseph Hinton, and his wife! Sometimes it takes one domino to start things, to connect the dots. With these great photos in hand, I was energized to get the written account finalized and published in the Kitchissippi Times. I stumbled across a handwritten biography of Joseph Hinton in the Lett family fonds, written by a grandson or nephew back around 1900. It was short, but contained some key pieces of info. I then took my 4+ years of notes on the Hintons, and began writing out the family chronology. Every time I came across a piece of information, or a newspaper article, I saved it in a file. Individually each piece says little, but put together, it tells a true story and gives a lot of key dates when the Hintons arrived, opened their farm, constructed their new house, and so on. There was just so much information that I found it impossible to edit down into just one article. So it looks like my profile of the Hintons will be at least a two-parter, maybe even a three-parter. The column includes the details of how Joseph's parents escaped death in a notable event in Ireland in 1798, how he made his way to Canada, the associations he made when he first arrived, his importance to the settling of Richmond, Ontario, and how he made his way to the neighbourhood that would soon bear his name - Hintonburg.